Skylor is a Ninjago minifigure first released in 2015. She is exclusive to the set 70746 Condrai Copter Attack, and also appears in the fourth season of Ninjago: Masters of Spinjitzu. As an Elemental Master of Amber, Skylor has the ability to abosorb the powers of other elemental masters, and is the daughter of Master Chen. 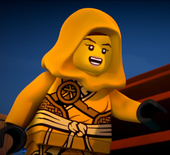 Skylor has a flame yellowish orange zukin ninja wrap over her head, with a 六 in cool yellow and outlined in black. She has black eyes with black eyelashes and white pupils. Her torso is flame yellowish orange as well and is printed with an angled dark orange strap leading up to a dark orange circle with 六 inside it. To the lower part of her torso there are circular dark orange pads on each side. Printed at the bottom of her torso is a cool yellow tied belt. Her arms are flame yellowish orange as well, and she wears black gloves. Her legs are also flame yellowish orange. Skylor's legs continue the belt printing from the torso and they also have dark orange pads on them. She is armed with a medium stone grey crossbow with a reddish brown quiver. Skylor is the daughter of Master Chen and the Elemental Master of Amber, of whom she inherited elemental powers. She was one of the Elemental Masters invited to her father's Tournament of Elements and naturally accepted the invitation.On the ferry ride to Chen's island, Karlof demanded that Skylor hand over her cloak as he was cold, but he was interrupted by Kai, who proceeded to fight him. After the fight was broken up by Clouse, Skylor helped Kai up, and upon taking his hand, absorbed Kai's elemental fire power. When the Elemental Masters reached Master Chen's island, Skylor was given a room to the right of Kai's. When the first round of the Tournament began where the objective of the competitors was to find a Jade Blade, Kai and Skylor competed to get a blade located between their rooms. During the race to get the blade, Skylor tricked Kai into giving her the upper hand, and she took the blade then proceeded to place it into a statue where Master Chen was waiting, gaining her a spot in the next round. After the round had ended, Skylor told Kai that she was glad that he had managed to find another blade and also proceed to the next round. She was about to tell Kai what her power was, but Kai cut her off, as he was distracted trying to smuggle Jay into his room as the four ninja previously planned to meet up and explore the island together to try and find Zane. When the ninja found a secret passage in Kai's room, they went passed Skylor's room and Jay and Kai briefly spied on her through two peepholes and saw her exercising, then proceeding to call on the element of Fire. On the third day of the tournament, Skylor faced off against Jacob, the master of sound, and won. The symbol on Skylor's zukin and chest (六) is the Japanese character for the number "6". It had for a long time been debated whether Skylor's powers returned after Chen was defeated, until it was confirmed they did in the Season 9 episode "Iron and Stone". 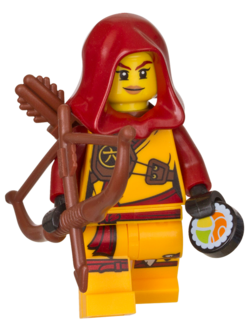 Skylor's mask from her 2015 minifigure is not shown in the TV show, nor her katanas and armor piece from her 2018 minifigure. This page was last edited on 23 July 2018, at 20:40.